TORONTO, March 18, 2019 (GLOBE NEWSWIRE) -- Emerita Resources Corp. (the “Company” or “Emerita”) (TSX-V: EMO) announces that along with its joint venture partner, the Aldesa Group (“Aldesa”), the first diamond drilling campaign is expected to commence March 18, 2019 at its flagship Plaza Norte project (the “Project” or “Plaza Norte”) in Cantabria region, northern Spain (Figure 1). Drilling is being conducted through its joint venture company Cantábrica del Zinc (“ZINCA”) which is owned 50% by Emerita and 50% by Aldesa. Diamond drilling equipment is presently being mobilized to the Project. The drilling program will be focused on high-grade Mississippi Valley type zinc, lead mineralization in the past producing Reocín mining camp. 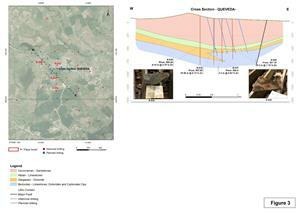 Initial drilling will be focused on establishing a mineral resource estimate that meets National Instrument 43-101 (“NI 43-101”) standards by following up mineralized drill intercepts identified in previous drilling by Asturiana de Zinc during exploration campaigns completed primarily in the 1980s and 1990s. This will be the first systematic exploration program in the region since the Reocín Mine ceased operations in 2003. The Property was not available for acquisition until the Public Tender process was launched by the government of Cantabria and was concluded in 2018. ZINCA was granted with 3,600 Ha of prospective ground. Emerita has digitally compiled and analyzed the large amount of historical technical data consisting of drill core logs and assays from more than 300 diamond drill holes, geophysical data, historical production data, and internal exploration reports for the Project. All this data was preserved in archives in the Mining school of the city of Torrelavega, located next to the Reocín mine. Emerita’s analysis of this data has resulted in 4 keys areas being identified as high priorities for exploration. These areas are from north to south: Yuso, Queveda, San Miguel and Mercadal (See figure 2). 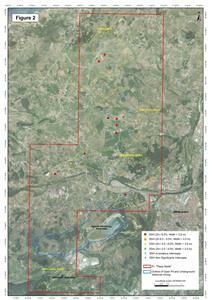 All of these targets have significant mineralized intercepts and Mercadal was the site of a past producing mine. Readers are cautioned that the historical data and records have been examined by Emerita’s technical team, including a by a Qualified Person, as defined in NI 43-101, but such data and records have not been verified by a Qualified Person. Further work is required to verify that the historical data and records are accurate. Diamond drilling is expected to commence on March 18, 2019 with a second rig expected to arrive on site in early April. The Company has engaged Sondeos y Perforaciones Industriales del Bierzo S.A. (“SPI”) as the drilling company for phase I of the drilling program. 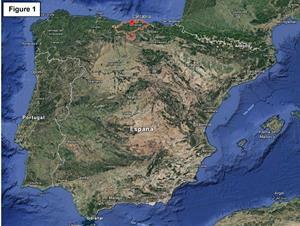 SPI has been in the exploration sector for almost 20 years, participating in many projects in the Iberian Peninsula. All core samples will be submitted to the ALS preparation laboratory located in Seville southern Spain, and assayed in ALS Rosia Montana Romania. The phase I drill program aims to follow up the historical wide spaced mineralized intercepts at the Queveda target, which covers a 1.0 km2 area. Historical drilling intercepted sulphide mineralization hosted by two different units from top to bottom: Dolomites (Gargasian) and Limestones (Albian). The drill holes have been selected based on the review of the historical technical data and its geological interpretation. Joaquin Merino, President of Emerita, is a “qualified person” as such term is defined in NI 43-101 and has reviewed and approved the scientific and technical information included in this press release and has approved its dissemination. Emerita is a natural resource company engaged in the acquisition, exploration and development of mineral properties with a primary focus on exploring in Spain and Brazil. The Company’s corporate office and technical team are based in Sevilla, Spain with an administrative office in Toronto, Canada. This press release contains “forward-looking information” within the meaning of applicable Canadian securities legislation. Forward-looking information includes, without limitation, statements regarding the Project, the mineralization of the Project, the commencement of the drilling program, the Company’s ability to establish a mineral resource estimate for the Project, the Company’s analysis of historical data and records, the Company’s exploration programs and the Company’s future plans. Generally, forward-looking information can be identified by the use of forward-looking terminology such as “plans”, “expects” or “does not expect”, “is expected”, “budget”, “scheduled”, “estimates”, “forecasts”, “intends”, “anticipates” or “does not anticipate”, or “believes”, or variations of such words and phrases or state that certain actions, events or results “may”, “could”, “would”, “might” or “will be taken”, “occur” or “be achieved”. Forward-looking information is subject to known and unknown risks, uncertainties and other factors that may cause the actual results, level of activity, performance or achievements of Emerita, as the case may be, to be materially different from those expressed or implied by such forward-looking information, including but not limited to: general business, economic, competitive, geopolitical and social uncertainties; the actual results of current exploration activities; risks associated with operation in foreign jurisdictions; ability to successfully integrate purchased properties or mining rights awarded; foreign operations risks; and other risks inherent in the mining industry. Although Emerita has attempted to identify important factors that could cause actual results to differ materially from those contained in forward-looking information, there may be other factors that cause results not to be as anticipated, estimated or intended. There can be no assurance that such information will prove to be accurate, as actual results and future events could differ materially from those anticipated in such statements. Accordingly, readers should not place undue reliance on forward-looking information. Emerita does not undertake to update any forward-looking information, except in accordance with applicable securities laws.